Hold music, automated menus and long waits are what many customers face when they phone their energy firm. So we’ve tested 38 energy firms’ phone lines, live chats and emails to find the fastest way to contact your energy company. Live chat is the fastest choice overall, our snapshot investigation revealed. 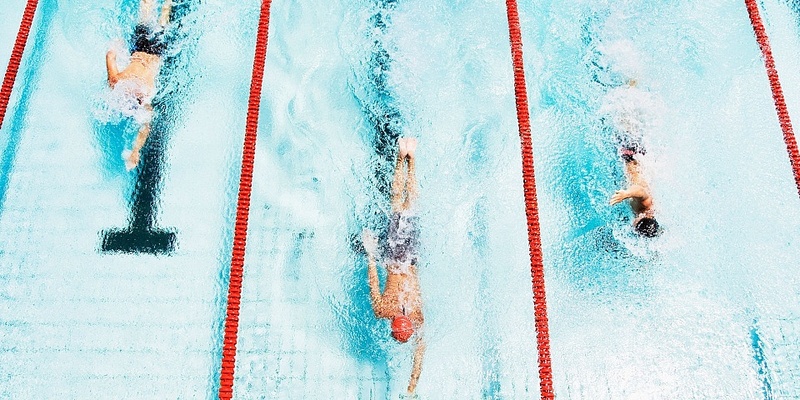 Across companies, the average time it took to get a response from a human was just 1 minute, 4 seconds. Phone was next quickest. It took us 4 minutes, 1 second on average to get through to a customer service representative. Unsurprisingly, we waited longest for responses when we emailed companies or used their online forms. It took 1 day, 23 hours, 11 minutes on average to get a reply. You’re probably less likely to email if you need an instant answer however. But these averages hide a world of difference in individual companies’ response times. Our investigation found over half an hour’s average difference in time spent waiting on the phone between the best and worst company. Email responses varied by more than 10 days between companies. Read on to find out the fastest way to speak to your energy company. Fed up of hanging on the phone? Use Which? Switch to find an energy company that offers the best deal for you and great customer service. How do you contact your energy company? Our survey of 8,000 members of the general public in September and October 2018 found that phone is the most popular way of getting in touch with energy companies. In the past year, 30% of people had phoned their energy company, while 14% emailed, 10% used live chat, 9% spoke to them in person and 2% used each of social media, text message and letter. So we included the most popular three methods in our undercover investigation. Does this surprise you? How did you last contact your energy firm? Tell us below. How did you last contact your energy company? 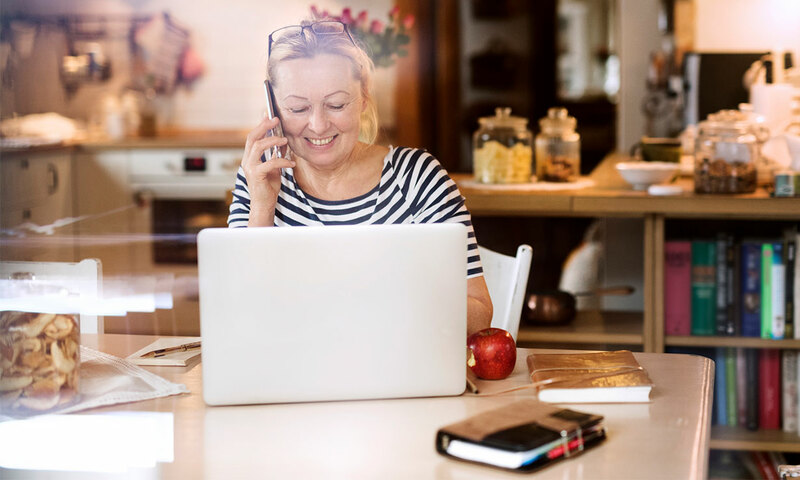 If you’re looking to speak to someone at your energy firm now – perhaps you had a problem you want to resolve – chances are you’ll phone them, or use live chat if they provide it. Eleven of the 38 companies included in our investigation offer live chat. We’ve compared the live chat and phone response times for companies which provide both to help you choose which to use next time you want to get in touch. It’s also faster to use live chat than phoning, but it could save you more time with some companies than others, according to our snapshot investigation. Scottish Power was the fastest overall, taking just 10 seconds on average, while Npower took the longest at an average of 17 minutes, 19 seconds. But Spark Energy – which stopped trading on the 23 November 2018 – had the biggest difference between its live chat and phone call pick-up times. It was nearly 27 minutes faster to use live chat than to phone in our snapshot investigation. In contrast, Outfox the Market’s times were less than 30 seconds different between the two ways of getting in touch. But Npower’s live chat was just three minutes faster to speak to a human compared with phoning it. While you’re waiting, Npower’s live chat tells you your place in the queue, as well as how long it estimates you’ll be waiting for. That’s useful, but no substitute for getting to speak to someone fast. Besides customer response times, see the best and worst energy companies for customer service, value for money and more. Email and phone calls: how much longer will I wait for a response? You’d expect it to take longer to get a response to an email than a phone call – but how long would you be prepared to wait? For companies which didn’t offer live chat, we contacted them by email or via their online form to find out how speedily they responded. Eight of the 24 companies included in our snapshot investigation responded within a day, on average, to our emails. The fastest was Solarplicity, which took just 2 hours, 30 minutes on average. Octopus Energy, Co-Operative Energy, Affect Energy and Sainsbury’s Energy were the next-fastest, all taking less than 20 hours. In total, 16 companies responded within a week on average. The slowest company was Green Network Energy. Its replies took 11 days, 2 hours, 54 minutes on average, and it also had the greatest time difference between phoning and email response. It took 11 days, 2 hours and 40 minutes longer, on average, to get an email response compared to speaking to a person on the phone. Ecotricity was the second-slowest to respond to its emails in our snapshot investigation. Will I get a response if I email my energy company? Besides exposing the companies which were slowest to reply to their customers’ emails, our snapshot investigation revealed how often companies failed to send a response at all within two weeks. Overall, 44% of the emails we sent to energy companies went unanswered within two weeks. Neither Engie nor Economy Energy responded to a single one of the emails or online forms we sent them as part of our research. Boost Energy, Flow, Solarplicity and Utility Warehouse all responded to just three of the 12 emails we sent them. But Octopus Energy and Tonik Energy missed just one of our emails. Below we’ve compared the average email response times with how many unanswered emails there were after two weeks, per company. 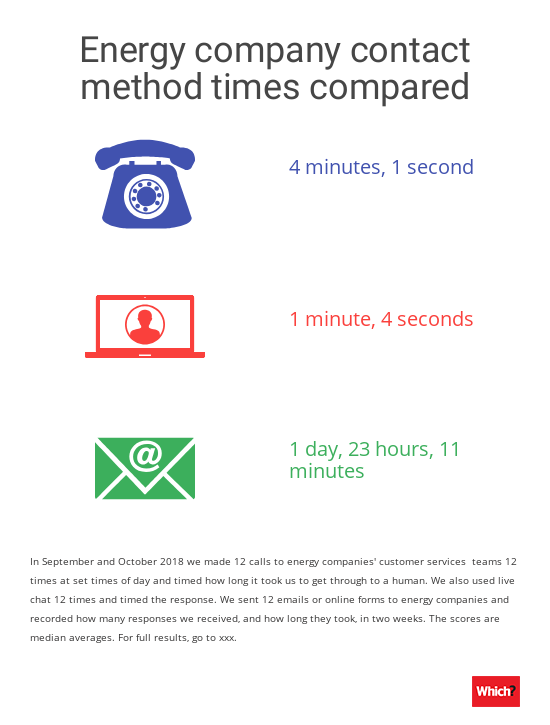 To find out how long energy companies keep their customers waiting, we made 12 calls to each company’s customer services at set times of the day and on different days of the week in September 2018. Where possible we phoned companies between 8am and 8pm to understand the full customer experience. We timed how long it took us to get through to a human. The times given are median averages. We also used energy companies’ live chat 12 times, where available, or sent emails/ online forms for companies which don’t offer live chat. Again, we timed how long it took to get a response (which wasn’t automated). After two weeks, we stopped timing email/online form responses. Extra Energy, GB Energy Supply and iSupply did not provide either digital contact method so have no scores for this.